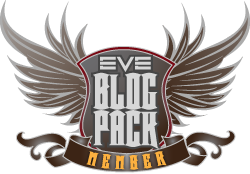 This edition of the Blog Banter is forged from suggestions from #tweetfleet members @KaedaMaxwell, @RocWieler and @TigerlilyFenix. In a socially-driven game environment such as EVE Online’s, everyone has an agenda. CCP promotes its products and has an army of volunteers to do the same; corporations and alliances deliver entertaining recruitment drives, CSM election candidates solicit for voter favour, bloggers and podcasters opine to their audiences. In this intricate web of communication, influence and control; what part does propaganda play in your game? I like this topic. A lot, and not just because I suggested it. I like it because it lends itself to one of the many reasons EVE Online is unique as a game. While the game itself is rich in lore, content and player experience, the metagame is only limited by our imaginations. Whether it’s art, fiction, third party applications, music or any other number of interests we have as players, we have an opportunity to do so much more with EVE Online than just play the game. I often wonder how much of this was by CCP design vs. how much turned out to be a happy accident. I’ve said this before and I’ll say it again – I never intended for Roc to gain any type of recognition in or out of game. Eve Online is a game. I wanted to play it. That is all. I’ve spoken before on how our characters are a distorted reflection of our real selves. We leak through no matter how hard we try not to. Sure, there are going to be areas of complete fiction to our characters should we be inclined to explore roleplay within New Eden, but our characters are made real because we are real. Eve is real. All of my real life interests have leaked into the brand of Roc Wieler. I’ve made wallpapers of RW&CO, Roc Nation, Read/Write DVD Drives, RW Pharmacy, and more, all because they have RW in them and therefore are part of my brand. I’ve composed and produced eight Eve Online inspired albums that have been received warmly by the player community, as well as several single releases on my SoundCloud. I’ve made dozens of 3D art pieces, written hundreds of Eve fiction stories, mostly about Roc. I was an integral part of the Capsuleer iPhone application. I’ve written a rudimentary desktop version powered by AIR that may or may not see the light of day. For every one thing I release publicly, there are dozens of things that remain in folders on my home network collecting virtual dust. Recently, I’ve been playing with 3D printing, trying to make myself a nice, yet affordable Rifter, from bronze. The pricing is getting there, but it’s not quite low enough yet. The Tri Exporter community has been instrumental in allowing us to pull actual assets from the game. A little understanding of Photoshop and a 3D program and it still amazes me how much I’ve learned across those disciplines in recent years. Maybe one day I’ll be 3D printing Roc Wieler statues. That would be kinda cool. PyjamaSam has even piqued my interest in quadrotor drones. I have a couple of manual fly hobby level ones, but they are nothing compared to the semi-autonomous, arduino based monsters he constructs for fun. His brains terrify me. Why am I telling you all of this? Because this is my propaganda. Smack talk is a thing of the past. It’s something children do and we are better than that. I immerse myself fully into the character of Roc Wieler. I let him do the smack talking through his works, ingame and out. Everything I do now is to promote Roc Wieler, promote the Eve Online community and promote better living for all gamers, and even non-gamers. Propaganda gets you noticed, whether for good or bad. It gets you remembered. Roc Wieler is a living, breathing part of New Eden now. He’s not just another pilot, although he is, he is someone who will be remembered, for a little while at least. If you’ve heard of him, you have an opinion, good or bad. The point is, you’ve proven the propaganda successful. Of course if you haven’t heard of him then I haven’t promoted the brand of Roc successfully enough, and I am continually learning new ways in which to do so. My wife has been instrumental in this. She’s not into games, or Roc, but she does derive great joy from my enjoyment of it. She wants me to be happy so does whatever she can to help me be successful in this endeavour. The bottom line is you need to promote yourself, your agenda, your alliance, your ideas. Ultimately, we are all confined in the game to the same sandbox rules so what makes you stand out? What makes you, your corp, or your alliance worth joining? What makes your story legendary? Will you be remembered? Get more involved in the game. Get more involved out of the game. Internet spaceships is serious business.